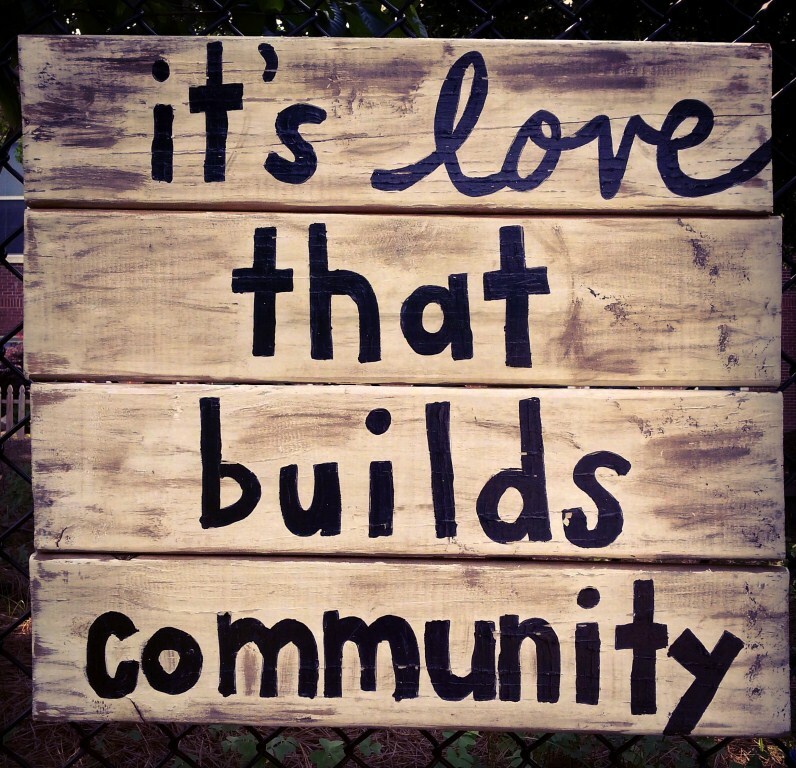 It does take love to build a community. It takes someone giving directives to build a team. They are so different and yet often confused. I am on my way to Spokane over the next 24 hours so I am not sure about tending my blog for the next few days as I travel and settle into a different routine. When we participate in a spiritual or healing practice, we become one with the source of abiding and ever-present love. We share, co-create and sustain a safe place where compassion and wholeness can be nurtured for ourselves and others. Participating in a spiritual practice is like lovingly tending to your plot in a community garden. Initially, the immediate benefit is personal. As the flowers and plants in your plot are nourished and receive regular care, the scraggly shoots thicken and unfurl abundant new leaves and buds. Eventually, the other community gardeners take notice of your beautiful flowers or vegetables, and are inspired to spend more time weeding, watering and caring for their own plot. One or two may even kindly pull a few weeds in a neighboring plot to offer support for someone who was not able to make it over to the garden that week. Tomorrow is my last day. I looked for the poem I thought would speak most eloquently to the role teachers can play. Bettye T. Spinner wrote this lovely poem. What if our classrooms were poetry meant to be lived and learned? It would speak to the wonder and awe of each day we spend with children. in knowledge that nurtures us all. overflowing with the bounty of our grange. Posted in Education, Mindful Life, Poetry, Reflective Moments and tagged Bettye T. Spinner, community, creativity, education, eloquent questions, Harvest Home, Mindful Practice, poetry, teacher as transformer. Bookmark the permalink. What a beautiful sentiment this is. Take care and have a wonderful day. A student gave me this poem Thursday. The Alberta Teachers Association published it in their monthly newspaper recently. Susan Holland, a retiring teacher, wrote it. Is there such a thing as a retiring teacher? The poem encapsulates many of my current feelings and points to the impact we have on children and families. The gesture of giving me the poem is deeply meaningful and I am grateful to receive and share it. We triumph together when you master cursive. We struggle through long division. Or someone bruises your heart. You read to me—I read to you. We laugh over silly jokes or stories. You refresh me with new perspectives. I wasn’t there when you were born. Or dance at your wedding. But, you are my children. You will move on and I will stay behind to start again. Warp and weft intertwined into my universal child. You are the fabric of my life. Posted in Education, Mindful Life, Poetry, Reflective Moments, Sabbath and tagged Alberta Teachers Association, creativity, education, eloquent questions, I Am a Teacher, Mindful Practice, poetry, school, Susan Holland, teacher as transformer. Bookmark the permalink. I posted this poem some time ago, but Simon explains why we keep coming back to Mary Oliver and her beautiful poetry over and over. For that matter, it is why we come back to poetry or the writings of people like Parker Palmer, Thomas Merton, and Thich Nhat Hanh who incorporate poetry in their prose. Each day should bring up a sense of renewal. It would be like picking up the edge of the ocean, shaking it out a bit, and letting it find its place again. This is a beautiful poem that gently reminded me of the need for self-renewal each moment, each day. Take care. challenge for the month of April. Maya Angelou is a wonderful poet and writer. Her quotes are gentle reminders of what should be important in life. This one asks me to stop and be present in this moment. It is the most important moment I have, because it is the only moment I can live in fully.